The Mt Hagen battleaxes are the finest yet seen in New Guinea ... Most of them are made in the villages of Gumbigai and Mangarvigar in the Manginbor area, where the stone for the blades is quarried. Their heads are a blue or grey stone of fine texture, beautifully ground and polished. 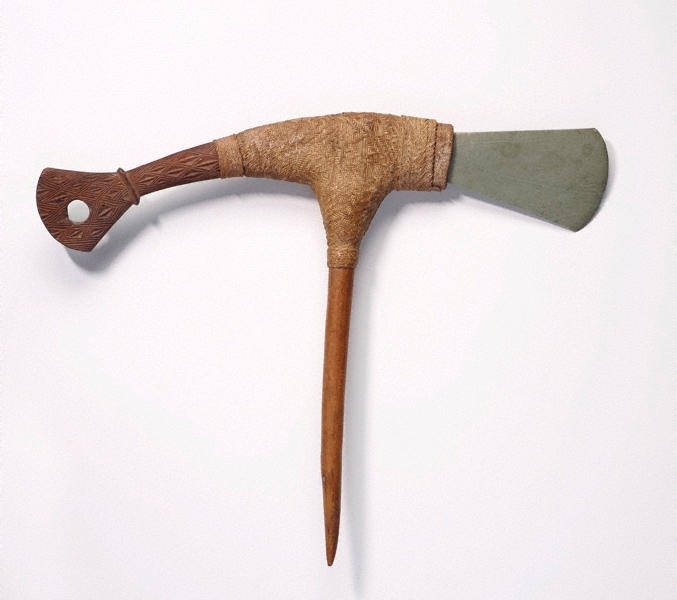 The blade is well housed in a wooden cavity, set in the same plane as the handle and counterbalanced by a piece of wood … set immediately behind and beautifully carved and decorated with fibre chains and fur … It is carried in the bark belt with the handle between the belt and the body and the head and counterpoise resting on the upper edge of the belt. When ready for action the axe is carried above the shoulder in an alert position with the hand near the blade.